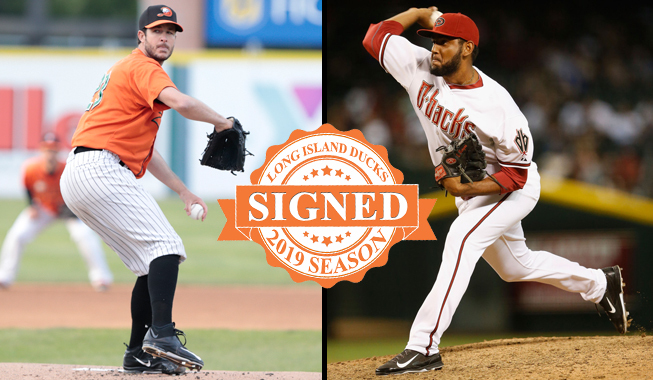 (Central Islip, N.Y., April 2, 2019) – The Long Island Ducks today announced the signings of left-handed pitcher Darin Downs and right-handed pitcher Enrique Burgos. Downs begins his third season with the Ducks and 17th in professional baseball, while Burgos enters his first season on Long Island and 12th in professional baseball. Downs spent three seasons in the Major Leagues, including two with the Detroit Tigers (2012-13) and one with the Houston Astros (2014). He combined to make 92 relief appearances, posting a 4-4 record with a 4.76 ERA and 84 strikeouts over 90.2 innings of work. The Florida resident tossed a scoreless inning in his MLB debut on July 3, 2012, against the Minnesota Twins and made four consecutive scoreless appearances to begin his Major League career (5.1 innings). Burgos pitched with the Arizona Diamondbacks for two seasons at the MLB level (2015-16). He made 73 relief appearances, compiling a 3-4 record, three saves and 82 strikeouts over 68.1 innings pitched. The Panama native tossed a scoreless inning in his Major League debut on April 29, 2015, against the Colorado Rockies. Burgos also spent time in the Atlanta Braves organization, pitching with Triple-A Gwinnett in 2017.